Two Navy Task Force Commanders, who share a common goal of deterring and disrupting piracy, although operating under separate organisations, recently met onboard HNLMS Johan De Witt in the Gulf of Aden. Pakistan’s Commodore Muhammad Ihsan Qadir, Commander of Combined Task Force (CTF) 151, and the Royal Netherlands Navy’s Commodore Peter Lenselink, Commander of the European Naval Force Somalia Op Atalanta took the opportunity to discuss the current piracy situation, and ensure that the Commands continue to support and coordinate with each other to deter and defeat piracy in the region. 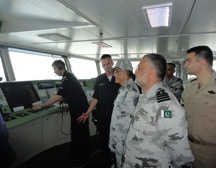 Commanding Officer of HNLMS JOHAN DE WITT, Captain Frank Foreman, briefs Commodore Muhammad. 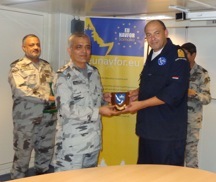 Ishan Qadir and Captain Khalid Pervez on the capabilities of the EU Nav For flagship. CTF 151 is part of the Combined Maritime Forces (CMF), a partnership of 29 nations dedicated to promoting maritime security in a region that incorporates the Red Sea, Gulf of Aden, Northern Indian Ocean, Gulf of Oman and the Arabian Gulf. European Union Naval Force Somalia Op Atalanta conducts counter-piracy operations in a similar area and was established in December 2008. HNLMS Johan De Witt is the current flagship for the Task Force. Commodore Peter Lenselink (right) presents a gift to Commodore Muhammad Ihsan Qadir (center), while Captain Khalid Pervez, CTF 151 Chief of Staff, (left) looks on. During the meeting, Cdre Lenselink highlighted EU Nav For’s participation in the EU’s regional capacity building mission, EUCAP NESTOR, which focuses on improving the situation on land in Somalia and neighbouring countries. At the same time, leaders from various regions in Somalia were also onboard attending a course aimed at improving maritime capabilities in Somalia. This, along with other similar efforts, is seen as having a significant impact on improving the situation in Somalia by helping to eliminate the environment that breeds piracy. Cdre Qadir said “Piracy in this area is on the decline and the combined efforts of CMF, EU, and NATO naval forces have played a major role in the reduction of pirate activity.